New Roof Plus, Roofing Arvada CO! Arvada roofing companies have been busy for the past couple years with all the hail we have seen. New Roof Plus, a Colorado owned and operated roofing company, is proud to help restore all the beautiful homes in Arvada, all of Jefferson County Plus the entire Front Range with complete roof replacement services and installation. We offer free inspections and estimates by Certified Roof Inspectors. If you live in Arvada or the surrounding area, you remember seeing the nasty hail storms roll through Arvada, Wheat Ridge, Lakewood and Jefferson County over the past couple years. New Roof Plus has been very busy roofing Arvada homes and commercial buildings due to the incredible damage from all the hailstorms that have hit us. Managing Partner and Roofing Project Manager at New Roof Plus, Greg Jones stated, “This has been an extraordinary couple of years for Colorado homeowners. Some folks have had two roofs replaced in two years”. Greg was born and raised in Littleton and now lives in nearby Highlands Ranch. Our goal is to be the best roofing company in the Denver area and the best roofing company in Colorado too. To achieve this, we know that every Arvada roof replacement and elsewhere that we install a new roof, requires our very best effort, close attention to detail, quality roofing materials, a strong bond with our customer (you) and consistent communication. Our many reviews on Google, Facebook and Yelp reflect our hard work in customer satisfaction. The hail and wind storms that hit the Denver metro area and as well as Arvada were devastating and in some neighborhoods, damaged hundreds of homes. We work every day for our customers and with their insurance companies to help get their Arvada homes roof repaired or replaced to the pre-storm condition as soon as possible. If you need a new roof or want an Arvada roof inspection, New Roof Plus is Certified by Haag at the highest levels in the roofing industry to find and assess your roof’s condition and if there is any damage. Our teams have years of experience and knowledge to execute a perfect roof installation plus other exterior projects like gutter repair and skylight installation. If using the best Arvada roofing company is important to you, New Roof Plus is worth a call to learn more. Arvada roofing companies have flourished recently due to all the hail storms. Arvada and neighbors were some of the hardest hit in the entire United States. Damage repair costs were in the billions. Roofing products and material such as wood shake shingles, three tab asphalt shingles, and concrete tile roofs were completely destroyed in many areas. The downside to all the storms has been the influx of “Roofing Gypsies”- storm chasers coming to Arvada to sell a few roofs and leave. 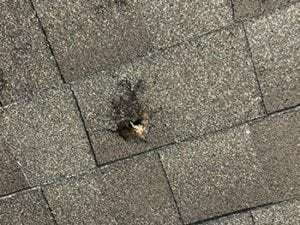 We’ve heard the stories about the roofing companies that take the first insurance check but do not do the work or do shoddy work. This is why we encourage Arvada homeowners to work with truly local Colorado contractors like New Roof Plus. 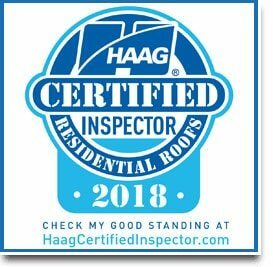 To earn this designation as a Haag Certified Residential Roofs Inspector one must prove a deep understanding of the latest damage assessment techniques with successful completion of an extensive exam. 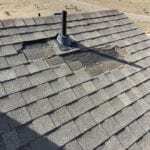 As your project manager, Greg’s experience and knowledge, and Haag certification, will give you the confidence you have one of the elite Colorado roofing inspectors inspecting your Arvada roof. Haag Roof Certifications are rare for an Arvada roofing contractor and they are even rarer when including all of Jefferson County and the entire state of Colorado. Taking the initiative to continually learn and become the best in the business is what Greg and the New Roof Plus team are all about. You have many Arvada roofers to choose from. We are building the best roofs, with the best quality roofing materials and building the best relationships one customer at a time. We hope to build a great relationship (and maybe a roof) with you too! We aim to be the Arvada roofing company you would definitely recommend! 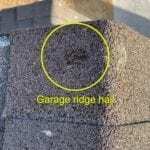 Arvada commercial roof inspections are more complex than residential roofs. But New Roof Plus is also Certified for Commercial Roof Inspections with Haag. If you are a business owner and have a Jefferson County or Denver area commercial building and you are concerned about the integrity of your commercial roof, New Roof Plus delivers true roofing experts who are certified at the highest level to give you an assessment of your building’s roofing system. A commercial roof that is considered a low slope roof or flat roof, require a roofing professional with a special skill set – different than residential roofing installations. Even gutter repair can be a complex system on a commercial roofing repair project! Jeff Co has seen many new commercial buildings, including booming areas along the I-70Corridor, the rebirth and popularity of Historic Olde Town Arvada, and many more new commercial structures that have sophisticated flat roof systems. A massive hail storm, as we have seen recently, can do substantial damage. If you own a low slope building or manage a commercial building with a flat roof system, you should have it inspected for issues -even if it’s a relatively new building. You want to have contractors who are familiar with building codes in Arvada. Low Slope or flat roofs with roof coating are prone to water pools so you want to make sure all water is diverting off the roof as designed. Metal roofing, while many would think it hail damage proof, often is not storm proof. New Roof Plus has installed many variations of metal roofing systems on both residential and commercial roofs. If you have a vision of a new metal roof on your Arvada home or building, give us a call for a free estimate and brainstorming for ideas and suggestions from one of our roofing project managers. We live here because we love it. We grew up here, we know and love the people of Colorado and we love roofing in Arvada and the front range. Coloradans appreciate being treated with respect and honesty. It’s our goal to reflect that, to be good citizens and to do great work, one customer at a time. We look forward to being your chosen Arvada roofing contractor, as well as Jefferson County and Denver CO, providing high quality products and materials, outstanding installations, and exceptional service. 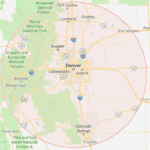 We serve all of the Denver CO roofing market, Fort Collins roofing market,Wheat Ridge, Louisville, Golden, Lakewood, Superior, Loveland roofing needs and all the beautiful cities across Jefferson County and the Front Range!